Snowy weather is on the horizon, and there's no way I'm staying indoors! I love too many fun winter outdoor activities, and your family will want to try these fun outdoor activities as you play this winter, too. In your backyard, in a neighbor's front yard, or at the local playground, build as many things out of snow as you can. There's really no limit to the number and types of creations you can build. So go wild and build a snow family, a snow horse, or a snow fort. Your family will have fun, exercise creativity, and develops gross motor skills as you play. My girls see cat, bird, and squirrel tracks in the snow every time they walk outside. Your backyard and neighborhood may reveal a variety of tracks, too. Learn more about animals and their habits and habitats when you check out animal track books from the library and research the tracks you find in the snow. Last winter, my girls took turns hiding small items in the snow drifts around our house. They hid toy cars, marbles, and even chocolate candies. They had hours of creative fun and practiced their observation skills during their scavenger hunt, and we're excited to invite the neighbors to join in the fun this year! Challenge your kids to an icicle-hunting contest. I know our house eaves often feature several icicles, but you can look on playground equipment or the buildings downtown, too. The winner of your icicle treasure hunt is the person who finds the biggest, fattest icicle. This activity gives your kids practice using a tape measure, and you can explore the science of icicles. All of the white, fluffy snow in your yard gives your family the perfect blank canvas for snow paint. Simply fill empty squirt bottles with a mixture of natural food coloring and water, then create colorful works of art. Your kids can get creative with their unique designs as they mix colors and hone their precision while drawing. Teach your kids how to build a fire in the snow, and you've taught them an essential survival skill. I know my girls love roasting marshmallows for tasty and warm s'mores, too! With shoe boxes and shoe laces, your kids can build their own snowshoes. My girls and I are definitely trying this craft as we walk on snow this winter. It uses their math, engineering, and mechanical skills and keeps them active. Dozens of bird species will stop by your backyard this winter if you feed them. We make suet and peanut butter wreaths each year and experiment with the best spots to hang our feeders. Your kids might also enjoy watching and learning about different birds this winter. Shoveling can be a chore unless you turn it into fun and work together. Your teamwork can clear your driveway and sidewalk in no time. Your kids can also be helpful or make extra cash by shoveling for the neighbors. Sledding was one of my favorite winter activities when I was a kid, and I definitely want my girls to enjoy making their own sledding memories! Not only is this traditional winter activity fun, though, but it's a workout that burns off extra energy. Outdoor winter play is as close as your backyard. 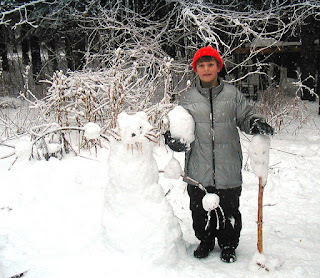 With a little snow and creativity, your family can have fun all season. What activity will you try first?